Mobile Apps - Vensi, Inc. Mobile Apps and the smartphone have forever changed the world in many ways and will continue to change our daily lives to come. The smartphone and the combination of mobile applications are sometimes understated in how it has advanced today’s technology. There aren’t many companies out there that aren’t mom and pop companies or startups that don’t have a mobile app and with good reason. This communication with cellular, Bluetooth, NFC and other wireless communications and mobile apps and the smartphone is a “win-win” situation for not only the companies that create and deploy these apps but for the end users as well. In previous years we have seen mobile apps used in many ways to send and receive data, for different uses like social media, online purchases, keeping in touch with work emails, and other work functions, still the list goes on and on. Recently with the development of the Internet of Things, mobile apps are becoming mandatory to communicate data. This was primarily seen in more commercial uses, now mobile apps, smartphones, and cellular technology are also being widely used in industrial use cases to communicate data, send alerts, notifications and status updates of different equipment and systems. Remote Communication is the best tool in any industry to monitor its operations with smartphones and tablets using Mobile Apps. The ability to communicate wireless provides users the ability to maintain its operations more efficiently in industrial environments. Industries like Building Automation, HVAC, Water Management, Lighting Manufacturers, Device Manufacturers and many others are taking advantage of Mobile Apps and Wireless Technology to create more efficient solutions to streamline their operations and business process. Wireless communication offers many new possibilities in any industry with flexible and efficient communication solutions, these solutions are modernizing industries that would not be able to move forward with their business goals without wireless technologies, especially in industrial environments, building automation and device manufacturing. If you are looking to create a Wireless Solutions using mobile apps for your industrial applications, Vensi, Inc has been working with Cellular, Bluetooth, NFC and other wireless technologies for decades with our experienced team of hardware and software developers create unique innovative solutions for our clients. 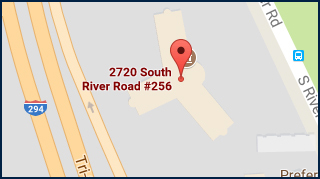 To speak with our Sales and Technical advisers contact us at vensi.com/contact_us/ or send mail to info@vensi.com. Preventative maintenance is an import aspect of everyday life for not only businesses, this also affects everyone’s daily life from cable installation and technical service to hospitals, and remote healthcare monitoring, to HVAC systems, electric motors and a number of manufactured products that are used to keep things running in our daily lives. Mobile apps are becoming the “Go To” tool for just about every industry, with Mobile Apps different industries are able to receive, view and share data while on the go, without a mobile application for your business can be a detriment to the growth of your business in the smartphone era. These mobile applications are helping to streamline business operations and helps to run the daily operations more efficiently. The use of Customized Business Applications in the service industry is spreading with good reason, it’s proving the highest levels of efficiency and improving field productivity for the technicians and engineers also bringing higher levels of confidence with their customers. Mobile apps provide the communication and data for not only the business and also for the customers, which in turn is providing amazing business insights to make changes to their operations. One of the examples of Mobile Apps are in, the healthcare industry is taking advantage of this technology to help remotely monitor vital signs of their patients. They are able to get real-time vitals of the patient and communicate with the patient about critical issues, without delays by having direct communication with home care patients. In different industries, the need to monitor pumping station and other equipment in remote environments is crucial to access the health and the running states to assure that these products are constantly running. Mobile apps are playing a major role in quickly accessing that information and relaying it back to the home base for analysis. Water management is another industry that is taking advantage of mobile apps to Remotely Monitor, track and even control the different scenarios in which water flow management is needed. With mobile apps, engineers and technicians are able to efficiently manage these operations with a tablet or a smartphone. 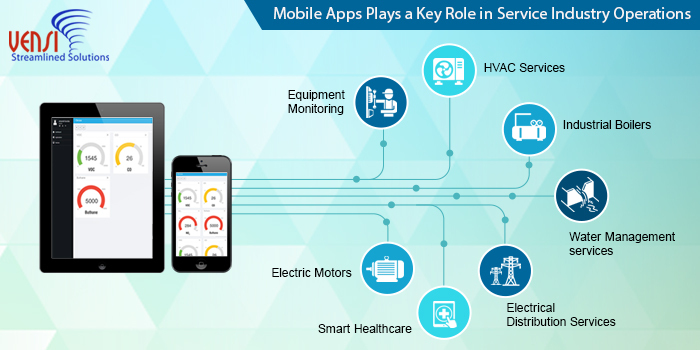 There are many applications related to the service industry that shows how the service industry is benefiting from mobile applications in many ways from receiving critical information, to transmitting that information to be later analyzed and in many cases mobile apps are used to do simple automated functions like scheduling tasks to technicians and engineers. The use of mobile apps is growing and in the near future, there will be many more use cases for these applications to help business to be for efficient and productive. Vensi, Inc has been working with mobile apps for a long time and have created many applications for businesses to be more efficient and productive. If your team is looking for innovative mobile application development. Please contact us at vensi.com/contact_us to help create a product that will enhance your daily operations. The Retail Industry is making changes to adapt to the purchase habits of its customers, by using technology to bridge the gap. 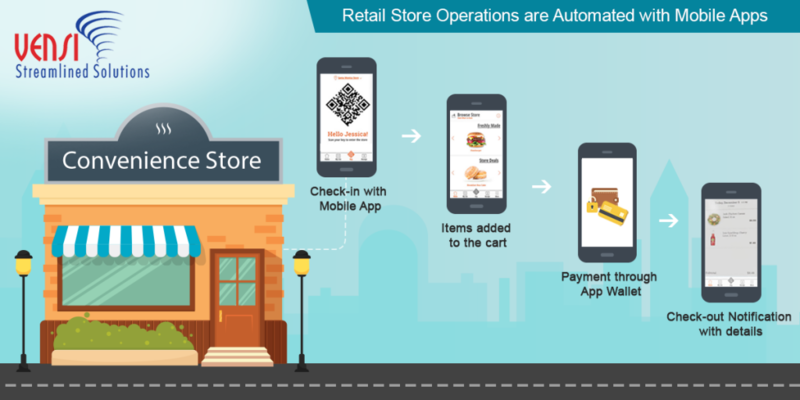 Adding automation technologies in the retail industries checkout process is creating a new seamless experience without the long wait at checkout lines, this is providing a unique shopping experience for shoppers that are on the go. Amazon has been working to completely automate the convenience store experience with a no checkout required system. The check out free shopping experience is made possible by incorporating a number of different technologies to track the products added to the shopper’s cart to their Amazon Go App. The Amazon Go convenience stores offer ready-to-eat breakfast, lunch, dinner, and snack options made fresh daily by their on-site chefs and favorite local kitchens and bakeries. The selection of grocery essentials ranges from staples like bread and milk to artisan cheeses and locally made chocolates etc, they are even offering well-known brands to these stores. Amazon Go’s vision is to create a shopping experience that will push the boundaries of computing and machine learning to where customer don’t have to deal with the hassles of long checkout lines. Amazon is taking the self-checkout concept to another level, in the self-checkout at major stores customers need to scan their items and either pay with cash or credit using a POS systems that handle the transactions. Amazon Go uses their mobile app to track groceries and process the payments once the customer leaves the store. Mobile apps are playing a major role along with other Sensing Technologies to accurately account for the checkout process and assure that the sold good are accounted for. Although there are a lot of different technologies that are making this shopping experience seamless, mobile apps plays a big role in the payment transactions, by tracking the customer entering the stores, tracking what products they have in their carts, accounting for the store’s inventory through transactions and many other activities to make this store a success. Mobile Apps and Smartphones are a big part in revolutionizing the retail industry. The Grab and Go concept has been predicted to be the future of the retail industries for years, we are now seeing that come to life. Developing smart mobile applications that can handle the communications that are needed to make this happen are vital to this change. The Retail Industry is facing a change in how people are making purchases, online shopping has been the trend and now retailers are adjusting to bring shoppers back into the stores. In 2016 the retail industry saw a huge shift in online shopping trends with customers shifting to online purchases. People spent $1.2 billion dollars through mobile transactions on Black Friday, the biggest shopping day of the year. That is not the only milestone that was reached, on Thanksgiving, online shopping increased 21 percent to $3.34 billion in sales surpassing 2015 numbers, which was $3 billion. In the US by the end of Black Friday shoppers spent $5.27 billion dollars online. To adjust to the change in how people are making purchases, retailers are coming up with new creative ways to make the shopping experience in stores more engaging. The retail industry is going to enhance the shopping experience in stores in a number of ways, the challenging part is bringing the physical and digital worlds together to create a unique, seamless shopping experience for Consumers. Companies are using technology to make the experience more engaging at home and in the stores, the retail giant IKEA is using Augmented Reality technology using mobile applications to allowing customers to virtually view 200 different IKEA products in their home with their new catalog. This will help people view furniture and other accessories before they purchase them, having purchased items in stores and that customers really like in the store, only to get home and find out it was not a good match will provide great value to customers. Retail stores are also taking advantage of data from mobile apps for a better in-store shopping experience that will be more beneficial to its customers, by knowing their shopping habits and browsing history retail stores can create a more engaging experience. These Stores are using different Digital Technologies like sensors, Beacons, NFC, Bluetooth and GPS to create the best engaging experiences for customers. These technologies can identify shoppers search patterns, how long a shopper dwells on certain products, purchase events, check out duration times and more; all the data provides excellent info to retailers so they can gear up their business for individual needs through personal campaigns. Shopify is a great example of a company who is changing the shopping experience. Their goal is to push the entire retail industry forward through analytics and by correctly predicting the shopping patterns for the future with software that is creating a new experience. They created an API Services that would interface with different POS systems out in the market to make their software compatible with for many different POS systems, this is not only streamlining the shopping experience but making it more engaging for shoppers. Vensi Inc, we are specialized in developing Mobile Apps for retail and commercial use. We developed service and utility mobile apps useful for many mobile users on different Mobile platforms & the web. 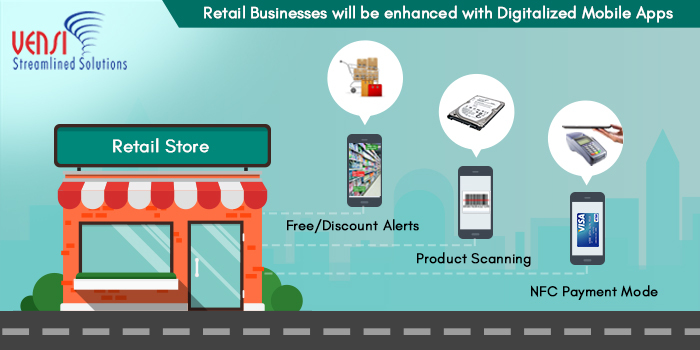 Mobile Apps are playing a key role in the enhancement of retail business to reach more people in future for better and easiest shopping experience with a click. Mobile applications are a huge part of everyday life for most of us, whether you’re a business person needing to respond to a client’s email, a student having to check homework assignment online, or a mom who is using her mobile phone to shop for groceries. Using a mobile device is the first choice to perform these and many other functions on what used to be relegated to strictly laptops and desktops. Mobile apps and smartphones are used in many ways and are the preferred choice of people who own them to conduct different tasks while on the go. For these mobile applications to function flawlessly, there are a lot of things that need to come together to make things work so that users see a seamless and fluid transition from screen to screen. One of the most important aspects of mobile app development is API’s. Most of us don’t know what they are, but if developers didn’t implement these well, mobile apps would not be as user-friendly. What is an API and why is it so important in mobile application development, Wikipedia defines API’s below. Application program interface (API) is a set of routines, protocols, and tools for building software applications. An API specifies how software components should interact. Additionally, APIs are used when programming graphical user interface (GUI) components. A good API makes it easier to develop a program by providing all the building blocks. A programmer then puts the blocks together. 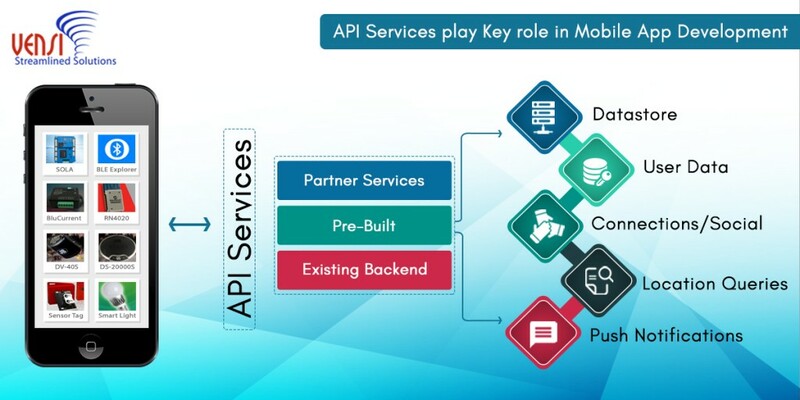 Mobile apps built with API’s allow for multi-platform development, not only for iOS and Android but also for web apps, this development strategy is enabling companies to add more mobile apps within their budgets. Eliminates redundant stack setup for each app. These benefits help developers to build apps faster, but also helps them link their software and applications to cloud-based storage, developers also like this API strategy for building apps because it eliminates redundant stack setup and repeated code. Vensi Inc uses API Services in their Mobile App Development & provides user-friendly, easily accessible apps for its clients & partners. For more information contact us at www.vensi.com/contactus. In this age of innovative technology we are seeing that nothing is staying the same, web app developers are putting their efforts into making sure that the web apps/sites are as advanced as the hardware they run on. In recent years the hype of the Internet of Things is being seen as not just hype, but the real thing as it will bring connected devices to the internet and that connectivity will provide great value to not only business but to users. Every sector of business is making strides to assure they have or are preparing and IoT solution in the coming months. Often the focus is on the hardware, mobile apps and cloud infrastructure, but the web app plays just as big of a role in IoT solutions. Web apps provide the User Interface, and functionality needed on a desktop to monitor and control the different devices. 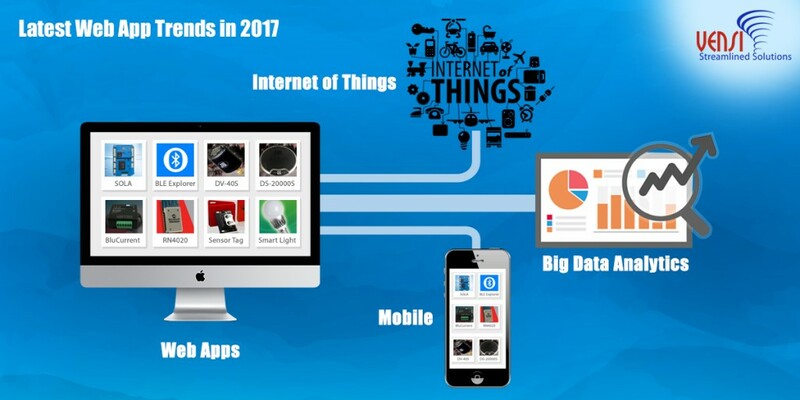 As the Internet of Things grows, we will see web app trends focused on IoT solutions. Internet of Things – As the number of internet-connected devices grows and users need a platform to monitor, track and control the devices and systems that are connected, web apps will be needed for those remote capabilities and many companies are focused on web apps to display the data and get historical data. Big Data – Big Data analysis is a big part of every business, the data used is streamlining the processes and creating efficiency within them. Mobile app developers are now creating hybrid platforms specifically for Big Data, so the user can get some of the critical data on mobile apps, but with web apps can get historical data for years. These web apps create complicated trending graphs that can be manipulated to view in many different formats. Mobile – Mobile applications are playing a major role in just about everything from IoT, retail experiences including payments, and controlling home automation. 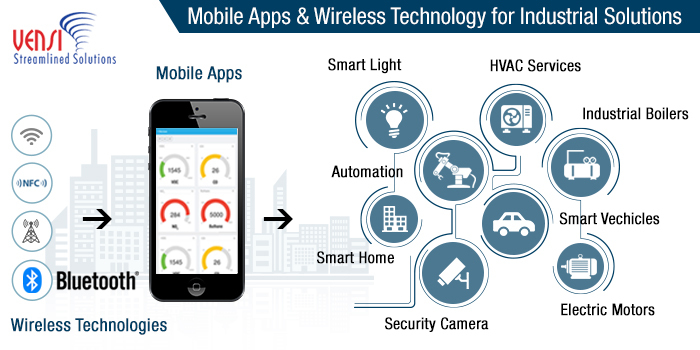 All these mobile app functionalities and more are internet of Things related solutions to enable users to have access locally or remotely to view data, remote control of devices and systems. The smartphone is an integral part of IoT solutions to display, control and monitor different things. Vensi’s BlueApp solution is a great cutting edge Internet of Things solution if you want to know more contact us to set up time with our team to go over your business strategy and help integrate our products and solution. For more information contact us at vensi.com/contactus. To many, open source is more than free software or a collaborative effort to continuously improve the computing experience. It is more than a philosophy of diverse ideas and motives coming together in a rapidly changing development marketplace. Open source is so dynamic that it often defies definition and limits. To techies, open source is freedom. As a mobile development firm, Vensi sees many advantages to open source software. Most notably, the potential for innovation and evolutionary leaps in application development is astounding. There is a critical mass of brilliant programmers working on new technology that is adaptable to the many different needs and motivations of the individuals and businesses involved. This is where a social movement comes together with technology to create the best possible product. There are certainly potential pitfalls with using open source that Vensi watches for as a premier mobile development firm. For instance, some say that because the code is transparent, it is more prone to bugs and vulnerable to hackers. In some ways, this is true, but we also find that the software and applications can actually be more dependable, because they are tested and effectively co-owned by so many talented people. Bugs are essentially fixed real-time; it is “wisdom of the crowds” at its hi-tech finest. As a concept, open source seems like it wouldn’t work in America’s capitalistic economy, and indeed, some modifications and constraints may be necessary for it to work in the business paradigm. However, open source can be a quick and relatively inexpensive way for businesses to develop new applications. In addition, the use of open source is viewed as progressive and inclusive, so new software and applications are often quickly embraced by tech-savvy consumers. The most notable drawback for businesses is that supporting a new application can get cumbersome. The modular nature of the code enables rapid (often for the better) changes and version proliferation. Compatibility issues can then arise, especially when a new version of a hardware platform is introduced. As a result, documentation and patches sometimes lag behind, leading to frustration for customers. Whatever the pros and cons, open source is most certainly a powerful tool that will penetrate deep into the future of mobile application development. We already see that the burgeoning Android market has created many opportunities for ingenuity and advancement in the creation of new applications. The open source future of the mobile world is a place where Vensi’s knowledge and expertise will shine. Copyright © Vensi, Inc 2017 All Rights Reserved.